Inspired by the support they received after learning their daughter had Down syndrome, Aubrey’s parents pay it forward. 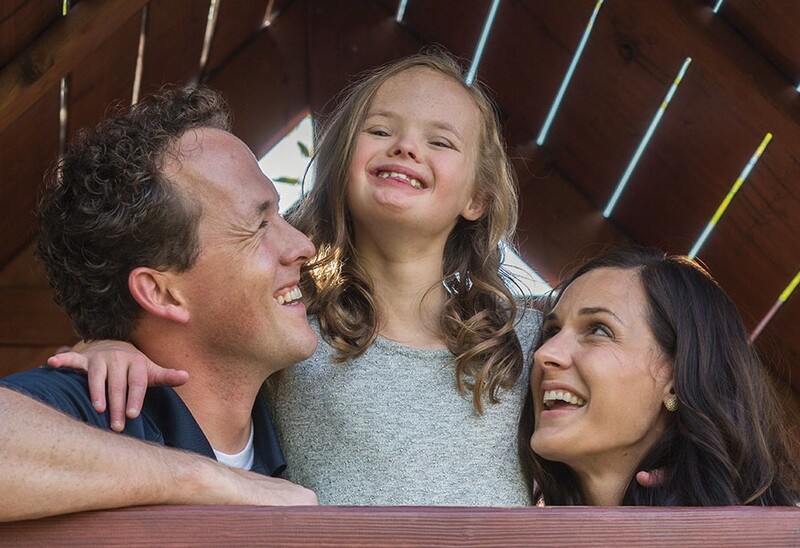 Yearning for an effective support system after the birth of their daughter, Aubrey, Mark and Amber Leck formed a foundation that provides myriad resources for parents and families of children who have special needs. Photo by Bradley Slade. Nearby, Mark H. (’07) and Amber Pann Leck (BS ’05) gather with their children and extended family, all wearing white baseball caps—“Aubrey’s Angels” embroidered in pink. Members of each family, along with nearly 2,000 others, are here to support the United Angels Foundation (UAF) in its annual Walk with Angels fund-raiser. It’s been eight years since Mark and Amber founded UAF, a nonprofit support group for parents and families of children—“angels”—with a variety of special needs, including Down syndrome, autism, cerebral palsy, and multiple sclerosis. In those years, UAF has helped more than 1,000 families through newborn visits, parent lunches, family activities, educational seminars, and more. Before their first child was born, Mark and Amber had every reason to expect a perfectly healthy baby. Amber’s prenatal exams and tests had been routine, and doctors and nurses detected nothing amiss. But with Aubrey’s birth came a diagnosis: Down syndrome. The news shocked the Springville, Utah, parents, who had no idea how they should feel. Then, while Aubrey was being treated in the newborn intensive care unit, a nurse named Kathy visited and provided what Mark and Amber call priceless support. Kathy answered questions and addressed concerns in a way the Lecks’ physicians, friends, and family could not. As the mother of a child with Down syndrome, she knew firsthand what the Lecks could expect. Soon after Aubrey’s birth, the couple joined a support group. It eventually fizzled, but not before Amber had met many parents who said they also yearned for an effective support system. “We realized not all parents of children with special needs are fortunate enough to meet their own Kathy,” Mark says. So the two got to work building a new support group: Mark focused on organizational and operational issues; Amber created a network of parents, planned events, and scrambled for volunteers. Inspired by their experience with Kathy, the Lecks made helping families adjust to the birth of a child with special needs one of their top priorities. In the last seven years, hundreds of parents whose newborns were diagnosed with a disorder have received home or hospital visits from the parent of a child with the same condition. The UAF volunteers offer mentoring, information, and emotional support. And at the spring Walk with Angels, UAF’s most successful to date, participants raised $70,000 to support that priority. Among UAF’s supporters is Provo attorney Randall K. Spencer (BA ’91, JD ’94), a member of the foundation’s board and a father whose son Christopher, less than 2 pounds at birth, has cerebral palsy. On the day of the Walk with Angels event, young girls with neon banners and tiaras gather in a corner of the park to participate in the Little Miss Awesome Pageant (spoiler: every single girl is named Little Miss Awesome). Among them is Mary Beth, who sings and dances on a small stage to a recording of Katy Perry’s “Roar.” She’s quickly joined by the Utah Jazz Bear and the Utah Valley University Wolverine, who jump on stage to dance behind her. At the song’s end, the beaming child laughs as they carry her off the stage. On the sidelines, BYU’s Cosmo and the University of Utah’s Swoop toss footballs and high five kids. Although BYU is a not an official sponsor of Walk with Angels, several athletes attend to greet the crowd and help raise funds. Paul H. Leck (BS ’14), Mark’s brother and a former BYU rugby player, sits at a booth selling signed BYU footballs and baseballs. Among UAF’s most significant projects is iPads4Angels, which provides essential aids for children in Utah special-education classrooms. Because of the iPads4Angels’ technology grant program, 75 classrooms in 52 schools have received iPads, and Apple invited members of United Angels to its Cupertino, Calif., headquarters to discuss the program and work together. In 2015 they collaborated on adaptive technology training for Utah special-education instructors, the first of its kind in Utah.